Following our example, let’s imagine that we want to know how many stock items we have that have a sell-by date of 10/05/2013. 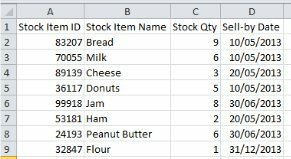 In this case we can see quite easily that the Bread, Milk and Donuts have that sell-by date, and that in total we have 20 units of those products – Of course in reality you’ll probably have much larger data tables than this. Criteria – This is the criteria that you want to match the Range against – It’s usually easiest to simply type the criteria you want to use into an unused cell and then use that cell reference in your formula. Of course this formula is useful for more than just stock audits, and it isn’t just confined to comparing dates. Your Range and Criteria cells could contain numbers, letters, codes, etc. so long as your Sum Range contains only numbers. If you’re still struggling with the SUMIF Formula you might find it helpful to have another look at the Getting started with Excel formulas page.